A good article on America’s Jacobin site, on another German party, this time the left Social Democratic Party, Die Linke, which was formed by the former SDP MP Oscar Lafontaine and the ex-German Communist Party PDS led by Gregor Gysi. 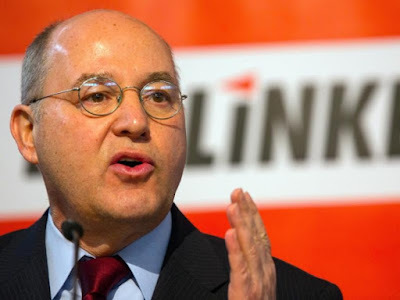 Instead of challenging the establishment consensus around support for Israel Die Linke and Gysi in particular has caved into a nakedly chauvinist and racist position of supporting Israel in all circumstances. People tend to explain this as the way Germany atones for the holocaust but that is not true. You don’t atone for one abominable crime by committing another. Shame over previous racism isn’t atoned for by another form of racism. The position of Germany’s parties – all parties from the Christian Democrat CDU/CSU to the Social Democrats SDP and Green Party Die Grunen – of unflinching support for Israel has more to do with Germany’s position as an unflinching supporter of American imperialism in Europe and the Middle East than atonement for the holocaust. Israel is, despite its recent disagreement over the Iran deal, the US’s vicious watchdog in the Middle East. It is armed and equipped by the USA to ensure that western interests in the region are protected. Of course there are occasions when Israel and the USA disagree but as former Secretary of State Alexander Haig once said, Israel is America’s unsinkable aircraft carrier in the region. It is a stable pro-western state and for that reason any human rights violations can be overlooked, not that the USA is particularly concerned anyway. 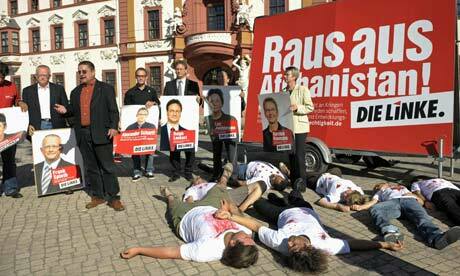 Although the position of Die Linke isn’t as bad as that of the Green Party, it is still appalling. Last December I covered thecowardly reaction of Gregor Gysi when two Jewish and Israeli anti-Zionists, Max Blumenthall and David Sheen came to the Bundestag. They were accused of ‘anti-Semitism’ by Gysi and of course the Green’s Volker Beck. It ended up in Gysi taking cover in the toilet as Blumenthal and Sheen chased him around the building. 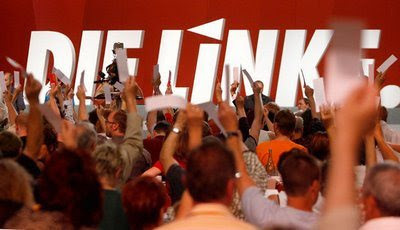 The behaviour of Die Linke is at one with the record of the former German Communist Party which veered, according to the Soviet Union’s Foreign Policy, from support for Israel and Zionism in 1948 to hostility to Israel as the latter threatened the USSR’s allies in the region, whilst at the same time supporting Stalin’s anti-Semitic ‘Jewish Doctors’ policy around 1953. 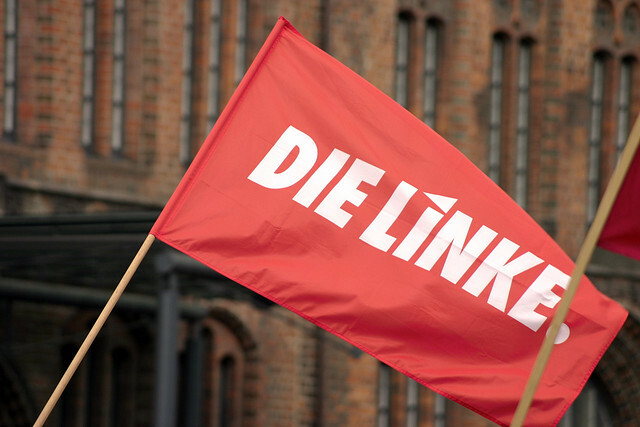 Die Linke’s position on Palestine has isolated it from the global solidarity movement. Annette Groth and Inge Höger, two Die Linke parliamentarians who were aboard the 2010 Free Gaza Flotilla, try to calm Sheen and his associate, Max Blumenthal. When I first moved to Germany from Cyprus during the height of the Second Intifada, I didn’t pay much attention to the conflict other than instinctively lending my moral support to whoever happened to be the oppressed in this and any other conflict. But at university, I was shocked to find that when left-wing, mostly autonomist-minded activists on campus used to talk about Palestine, it wasn’t even to adopt the minimally acceptable position of condemning Israel’s brutal “pacifying” of the West Bank and Gaza Strip, but to romanticize the country as some kind of Middle Eastern Cuba under threat from Nazi-inspired Palestinian suicide bombers. Israel did not figure prominently in the beginning of the Antideutsch movement. This changed after the outbreak of the Second Intifada and 9/11. The Antideutsch were already thrilled by Daniel Jonah Goldhagen’s Hitler’s Willing Executioners. They now fervently applied his idea of “eliminatory antisemitism” to virtually any movement opposing US and Israeli hegemony in the Middle East, be it secular nationalist or Islamist. They also include Klaus Lederer, Die Linke’s chairman in Berlin, who spoke at a pro-Israel rally during the 2008–9 war on Gaza. 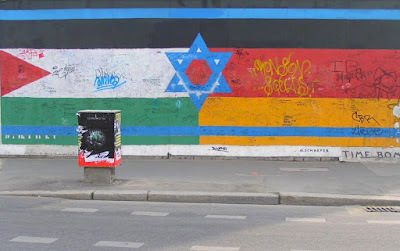 “Reflection” and “guilt” over East Germany’s record of “one-sidedness” in the conflict are stated as the main reason for this tilt to the Zionist point of view. Descending from the old GDR’s state-affiliated professional caste, it is not hard to recognize why being in government is seen as a more effective way to change things than being in a movement. What can tilt the balance is an active linking with the international solidarity movement, as some scholars of the Rosa Luxemburg Stiftung attempted last summer, pointing to the striking contradictions between the party’s internationalist identity and its stance on Palestinian national liberation. 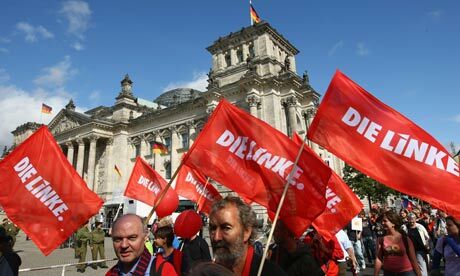 It’s part and parcel of creating a movement dynamic enough to challenge the “new German ideology.